This book is about a garage band from Michigan, that scored a hit in Pittsburgh, went on to create a new genre of music, and gets ripped off for most of the money by Morris Levy, the infamous New York promoter who signed everyone but never paid a dime in royalties. There was an old joke in New York that went like this; "Why does Manhattan have 2 rivers? Because one isn't big enough to hold all the bodies Morris Levy puts there." 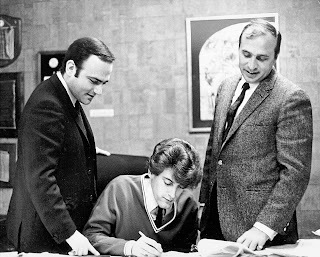 Mr. Levy was the head of Roulette Records, and several other music publishing companies, who preyed on naive song writers and artists like Frankie Lymon, and of course, Tommy James. The story of how Tommy James finally hired someone who was able to break the mystery of the missing $40 million in royalties is, by itself, worth the read. 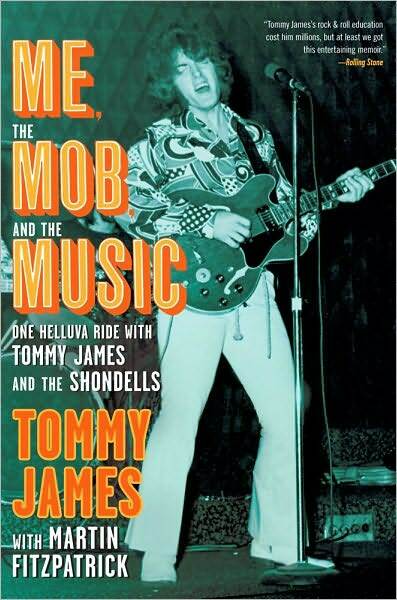 But this book is more than just a kiss and tell tale of the dirty workings behind Rock and Roll music. It is also a look at the life of Thomas Gregory Jackson, later Tommy James, and his life in music. His first band was the proverbial garage band. Tommy was 12 years old at the time. Before he finished high school he would have a Number One record with "Hanky Panky", a song the group kind of "rewrote" after hearing another group called The Spinners do it one Sunday afternoon. They didn't even have a name for their band, let alone the lead singer at the time! Tommy James came about on a whim in the New York offices of Morris Levy. This is a photo of that moment. The image of this kid playing concerts on the weekend and then going back to school Monday through Friday is almost amusing, but his determination to "make it" is admirable. Through 3 marriages and his problems with "uppers" and amphetimines, this book is as honest as it is brief. At a little over 200 pages, I hadn't expected so much depth from the guy who did "Mony, Mony", which was inspired by the flashing sign in Manhattan for Mutual of Omaha New York. I was also surprised that the author of such psychedelic classics as "Crimson and Clover", "Crystal Blue Persuasion", and "Sweet Cherry Wine" never did LSD or any of the other psychedelic drugs. This is a very honest and revealing book which offers a look at what it's like to be an innocent caught up in the music scene. It is also the story of one man's struggle against the odds, bad promoters, dishonest agents and his own weaknesses. And in the end, it is the story of the man who emerges, fulfilled with what he has done and where he has landed.